Traditions old and new thrive in Westendorf and the Brixen valley. One such special event is the 360 year old Antlassritt that takes place on Corpus Christi. This is a religious procession by farmers from the towns of Kirchberg in Tirol, Brixen im Thale and Westendorf. Year after year locals and guests take pleasure in viewing the imposing spectacle of 100 or so beautifully decorated horses being ridden through the valley. Starting in the main square in Westendorf, they are joined by local bands and processions of villagers in traditional costume along the Brixen valley. The Antlassritt will take place on June 20th 2019. The origins of the celebrations are unclear but tradition has it that the Antlassritt commemorates the 30 Years‘ War in the 17th century, when the villagers of the three communities beat back Swedish troops on the Klausenbach river. 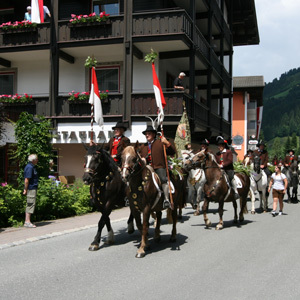 Every year, on the religious festival of „Fronleichnam“ – Corpus Christi – the farmers (exclusively men) ride to the „Schwedenkapelle“ chapel in Klausen near Kitzbühel to commemorate their victory. To find out more fill out the enquiry form on our main Sport Ruetz website or have a chat on the ‚phone with a member of our staff. +43 699 1989 6321 Contact details are at the foot of this page.